Update: Sören released version 2.0 of the extension recently. It adds options to save, load, and delete configurations. 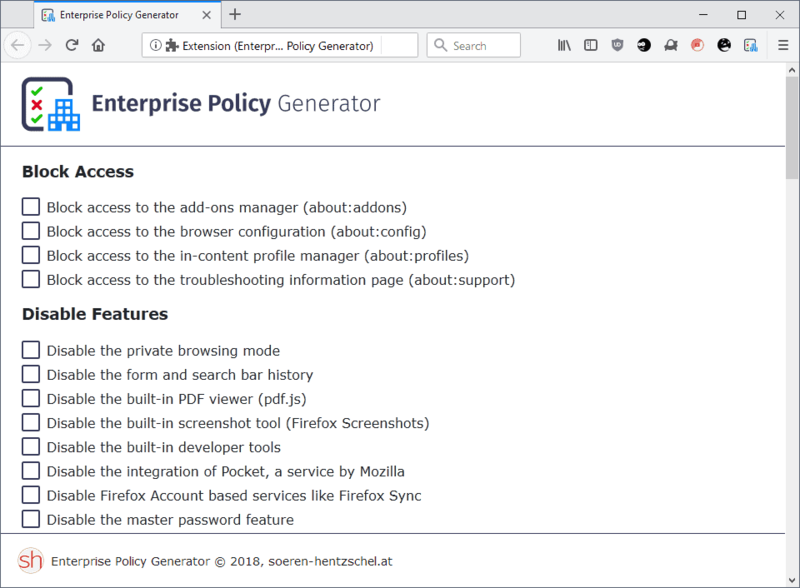 Usage is simple: You may use the shortcut Shift-F10 to open the policy generation page or click on the extension's icon in the Firefox toolbar to do so. Some policies require additional data while others are simple enable/disable preferences. If you select "install, uninstall or lock extensions", for example, you are asked to specify add-in installation paths, extensions IDs for the removal or locking of add-ons. The descriptions are sufficient to understand what individual policies do. Some policies include "more information" links which lead to Mozilla's Developer Network site. Click on the generate policies button once you have selected the policies from the available list. The extension displays the JSON structure of the policy file; you may copy the data and create the policies.json file by yourself or click on "download policies.json to download the file instead to the local system. One downside of the current version is that policy configurations are not saved which means that you can't update existing configurations but need to start anew each time you need to update the policies file. I didn’t use it (yet) but I like the idea of this addon. Thanks, Sören! > If there is one thing to criticize here, it is that there is no indication whether a policy requires additional input or not before you select it. Granted, it is not a big deal and it is clear for the majority whether additional input is required or not. That was an explicit design decision. Let me explain why I chose this UX. 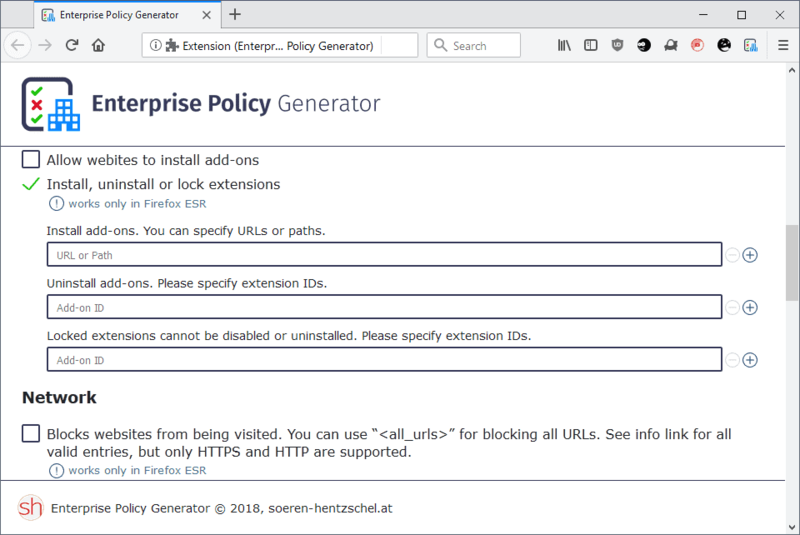 In the first pre-release versions of the extension, all suboptions of all policies were visible before you selected a policy. The suboptions looked disabled but were visible. This meant that you had to scroll a lot and scan a lot of information with your eyes to see and understand all the policies, even though most of the users are probably only interested in a few policies anyway. In addition, Mozilla is already implementing more policies, do it’s becoming more of a factor with each new policy. Therefore, the decision was made to only make visible what is relevant and to improve the UX. And if I don’t enable a policy, the suboptions have no relevance. But additional input is required for a policy and there is no default value then there is a clear indication of the mandatory field(s). Sören sure that makes sense. I did not mean to expose the entire options right away, just a small icon or something to indicate that you need to do more than just check the box to use the policy. Could i please get some help with the deployment of firefox 64.0.
enter about:policies into the address bar and press enter. If your policies.json file contains errors there will be an error tab where you can see the errors. This seems to be wrong imho. – Delete or move the old profiles and configuration of Firefox in “%appdata%\Mozilla”. I would appreciate any other comment on this. This was the only way I could apply the policies.json. > This seems to be wrong imho. You need to put the file policies.json into the distribution directory inside the installation directory of Firefox. That’s what you can read anywhere and that’s the correct way for sure. I don’t use Windows and I don’t know why you modify the installer. But I guess Firefox-setup\core\ contains the content of the later Firefox installation directory. If it works for you just check the installation directory after the setup. Are you sure this only works in ESR ? I tried the following in Firefox 62.0.3 Release (yeah, outdated, but not ESR) and it did block websites. I tried this in order to check that all the “only works on ESR” options really didn’t work. It’s annoying to check if DisableAppUpdate is working, so I went for an obvious option like WebsiteFilter. Since it works, I’m questioning other items too. Do you remember what your source was ? Since Firefox 63+ suppresses the app.update.enabled about:config options, I’d like to make sure DisableAppUpdate replaces it properly. A bit more research suggests that there are policies that will not work on the Release channel. Those should be marked with “enterprise_only”: true in the source code. But the only policy marked as “enterprise_only” is SearchEngines, for instance DisableAppUpdate isn’t. Is there anything you know that contradicts this and turn DisableAppUpdate into an enterprise_only feature not available on the Release channel ? Sorry for the centuple post. I confirmed that SearchEngines policy does not work on the Release channel. I also confirmed that SearchBar, Homepage and WebsiteFilter, DisableTelemetry, the only four policies that I can test without a hassle and that this article marks as “ESR-only”, actually work on Release. I’m going to extrapolate these results to all other policies listed as ESR-only in the article except SearchEngines, including auto-updates and system add-on updates. Also, I’m pretty sure even SearchEngines policy works on Beta and Nightly, not just ESR. But it does fail on Release and it’s most likely the only policy that does, according to this digging into the source code + partial testing. It does seem like DisableAppUpdate also works on the Release channel, not just ESR. While I can’t really verify it by testing, the source code doesn’t seem to show much of a difference regarding this policy between Release and ESR 60 ? @Jamy: Some policies *WERE* “ESR only” when Firefox 60.0 and Firefox ESR 60.0 were released. All “ESR only” policies but the SearchEngines policy are *NO LONGER* ESR only since Firefox 62 and Firefox ESR 60.2. Of course your DXR links show that the SearchEngines policy is the only “ESR only” policy because you didn’t used permalinks for a outdated revision but the current version. The current version of Firefox ESR is Firefox ESR 60.4. Of course all descriptions in the Enterprise Policy Generator refer to the current versions of Firefox. And of course Martin wrote “ESR only” for a few policies more because when Martin wrote the article Firefox 60.0 and Firefox ESR 60.2 were the current versions and the version of Policy Enterprise Generator wrote “ESR only” for these policies at that time. The content of this article refers to May 2018, not January 2019. That’s because of the fact that search engine hijacking was always a serious problem for Firefox users, so it’s kind of a protection for the users that search engines can’t be changed “from the outside”. But in general Mozilla doesn’t want to restrict policies, so the SearchEngines policy is an exception. Which reminds me of one question. I don’t have group policy for Firefox when I look into gpedit.msc. There is no “Mozilla” entry where there should be. I’m on Windows 7 Ultimate and Firefox 64. Could it be because I declined to install the “maintenance service” ? Because I installed in D: with the OS installed in C: ? Or is that a bug I should report ? It never worked, from 60 to 64, no group policy for Firefox. I use a JSON file so it’s okay, but if it’s a bug I’ll consider taking some time to report. is there a way to use relative paths for installing extensions? How do you set this up on an android device? There is no Android support.